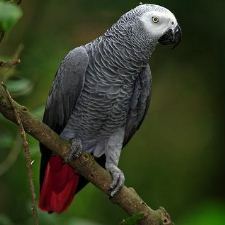 African Greys are beautiful, intelligent parrots that make a wonderful addition to any family who fully understands their capabilities and provides them with simulating, interactive environment. Building a relationship takes time and patience but these animals reward their owners with a lifelong friendship. They are noted for their exceptional talking and cognitive abilities. Irene Pepperberg lecturer with Harvard University is nationally recognized for her work with Alex an African Grey whom developed a large vocabulary and was able to use the works in sophisticated ways that were comparable to that of a two-year old child. Her work demonstrated not only the mimicry of an African Grey but also the cognitive capabilities of this species and parrots in general. They are highly social animals and benefit from having lots of space to move around, interact with their owners, and toys/activities that keep them busy. Probably the most important thing to consider when selecting an African Grey cage is the total interior space. Although Greys seem small compared to large parrots, they are very social birds and need a large amount of space inside their bird cage to move around and stay active. Most experts recommend getting as large a bird cage as you can afford. As a guideline, we recommend customer consider African Grey cages that are 36” wide, 24” deep, and 40” high. However this is not possible a minimum cage size for an African Grey cage is 34” wide, 24” deep, and 36” tall. Also important to the African Grey are bird toys and activities. Be sure you select a bird cage that has sufficient room to add many different toys, activities and perches. 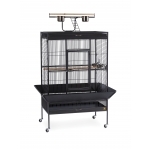 Because they like to socialize with their owners you may want to consider a bird cage that provide multiple places outside the cage to perch. - Greys are highly active and benefit from a larger cage, consider a minimum of 34" wide, 24" deep, and 36" tall.